Property Size 665 sq. ft.
Coronado Place is located just east of Sabino Canyon Road off of Tanque Verde. Close to dining and shopping. Located on a bus line with easy access to parks and recreation. 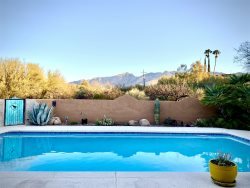 Drive to Sabino Canyon in just minutes. This is a one bedroom, one bath, downstairs condo. The condo is next to the pool and faces South. This is a great retreat for two! Covered parking for one. Open parking for guests.